Vice President Yemi Osinbajo, SAN, receives UK Secretary of State for Foreign and Commonwealth Affairs, Rt. Hon. Boris Johnson and the Secretary of state for Internationals Development, RT. Hon. Priti Patel on a courtesy visit, State House, Abuja. 31st August, 2017. As the Buhari administration continues its drives to promote private sector partnership, it remains ready to provide the necessary assistance to private investors looking to invest in the country, according to Vice President Yemi Osinbajo, SAN. 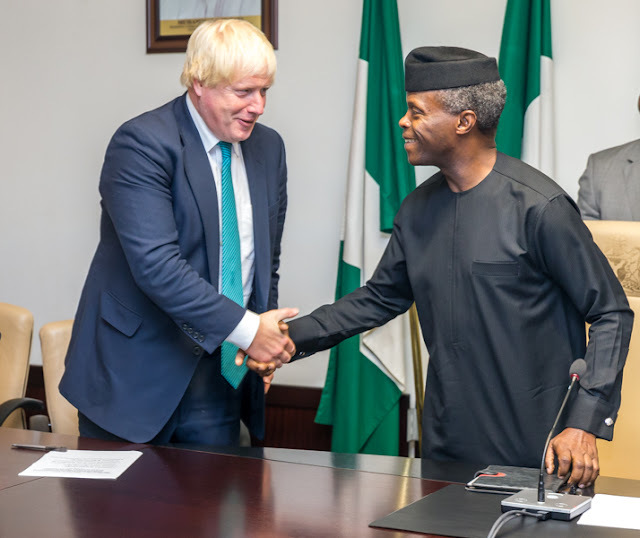 Prof. Osinbajo stated this when a delegation of UK Ministers led by British Foreign Secretary, Boris Johnson paid him a courtesy visit at the Presidential Villa today. Also at the meeting were Foreign Affairs Minister, Mr Geoffrey Onyeama and Budget and National Planning Minister, Senator Udoma Udo Udoma. important, assuring that “the next few years are certainly going to be more interesting”. He mentioned that Nigeria has huge potential and according to him, “investors would salivate if those potentials were realised” and the country is “close to the tipping point in terms of making that happen”. He added that in terms of trade, Nigeria had no choice but to diversify from oil and now more attention is focused on agriculture, agro-processing and more interest in technology. In the area of housing, Prof. Osinbajo stated that Nigeria would be looking to partner with the United Kingdom, adding that government is interested in construction companies with the expertise and technical know-how to deliver mass housing projects across the country. He assured investors that the Federal Government is prepared to partner with them, provide assistance where necessary and solve the problems as they emerge. 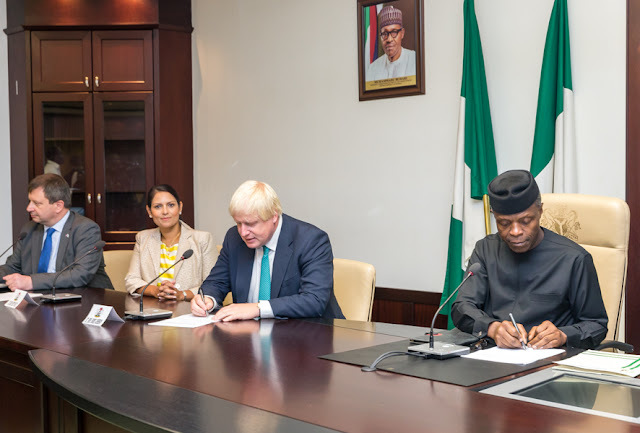 In his own remarks, the UK’s Secretary of State for Foreign Affairs, Mr. Boris Johnson, who observed that “Nigeria has an amazing future”, stated that the United Kingdom is partnering with Nigeria in different areas including intelligence sharing in the fight against terrorism. 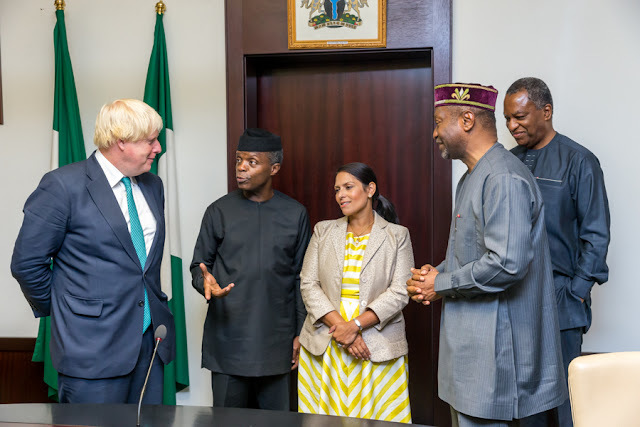 Johnson added that the UK is also working to build an economic partnership with Nigeria given the country’s status as the powerhouse of Africa and the biggest economy in the continent.